A French composer born March 24, 1955 in Algiers. After studying musicology at the University of Tours, Thierry Alla entered the Bordeaux Conservatory, notably in the composition class of Michel Fusté-Lambezat and the electro-acoustic composition class of Christian Eloy. His musical sensitivity has been marked by Debussy, Varèse, Stravinsky, Ligeti, Messiaen, but also Tristan Murail, Gérard Grisey and Hugues Dufourt. Each one of his works is moulded by considerations of global form and a masterly control of time. Alla’s compositional investigations focus principally on sound: tone-colour, movement, and colour. He is fascinated by multiphonics – the basic raw material of many of his works and, in order to colour sound space, he frequently uses electronic techniques (Nébuleuse for ‘cristal Baschet’ and electro-acoustic tape, 2008) and also micro-intervals (Sanctuaires, concerto for saxophone and orchestra, 2009). Matter, natural elements (Concerto étoiles, 1989) as well as the psyche (Hypnose, 1986), are recurrent themes in his output. 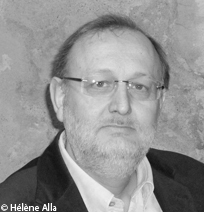 President of the Association Proxima Centauri, Thierry Alla is also a musicologist, a specialist in spectral music (his doctoral thesis on Tristan Murail was presented in 2005); he is a teacher of musical education and teaches at the University of Bordeaux.